What is smudging? 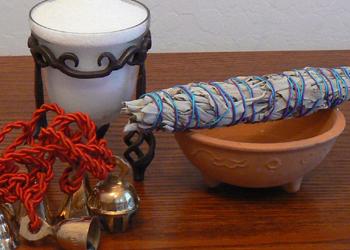 What is a Smudging Ritual? What is a Smudging Ceremony? A smudging ceremony is often carried out for the purpose of clearing negative energy, and inviting peace, harmony, and ease into a person's life, a challenging situation, or an uneasy or negative environment. It can be as involved as you want it to be. Sometimes, all that is required is a quick waft of the smudging wand to clear the energy. Other smudging rituals and smudging ceremonies require more time and attention. It's up to you to decide how much time and energy to devote to your ceremony. Essentially, to carry out a productive ceremony, you need to be clear about your intent and focus on what you are trying to accomplish. 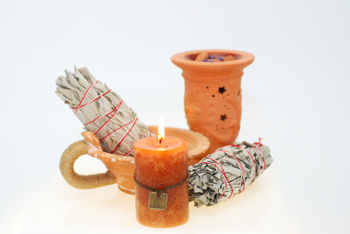 The actual smudge burning can consist of using as little as a few herbs placed in a burning fireplace, or as much as several wands of different herbs burnt until the energy feels right. There must always, however, be intent and focus in order for the clearing to take place. To learn about the wide variety of rituals and ceremonies that are possible using sage and smudging, Sage & Smudge: The Ultimate Guide can guide you to a deeper understanding of the world of smudging. In the book you will find complete outlines of several popular useful sage and smudge ceremonies, and a list of 101 suggestions for personal ceremonies others have found helpful. Test any or all of these as you compile your own list of favorite practices. Concepts presented on this page and in the book Sage & Smudge: The Ultimate Guide derive from traditional European and American metaphysical and folk lore. They are not to be understood as directions, recommendations or prescriptions of any kind. Nor does the author, page creator or publisher make any claim to do more than provide information and report this lore.